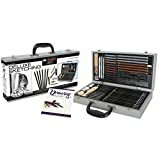 Interested in the Royal & Langnickel RSET-SKET2000 Wooden Box Sketching Art Set, Multicolor? Is the price too high? You can easily price watch this product and we'll notify you when the price reaches your target.